Symposium on February 26 and 27 on the Oberlin College campus. 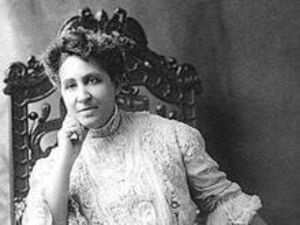 Occurring at the intersection of the Black History Month and Women’s History Month, this symposium celebrates a significant gift of Mary Church Terrell papers to the Oberlin College Archives. Terrell (1863-1954), Oberlin College Class of 1884, was a feminist and civil rights activist, a founding member of the National Association of Colored Women (NACW) and the NAACP, who worked tirelessly across lines of race and gender to achieve a more just and equitable society. We celebrate her life while using this opportunity to think together about social justice today. Participants include Terrell descendants Ray and Jean Langston, keynote speaker Johnnetta Cole ’57, prominent Oberlin College alumnae Lillie Edwards ’75, Treva Lindsey ‘04, Rachel Seidman ’88, Jennifer Morgan ’86, and Lori Ginzberg ’78, as well as current Oberlin students. Cosponsored by the Oberlin College Archives, the Institute for Gender, Sexuality, and Feminist Studies, the Africana studies department, the Oberlin Alumni Association of African Ancestry (OA4), and the Alumni Association, and with support from the Comparative American Studies Program and the history department, Oberlin College Libraries, the Office of the Dean of Students, the Dean of College of Arts and Sciences, the Office of the President, and the Friends of the Oberlin College Library. The Symposium begins at 4:30 p.m. on Friday, February 26, i King Hall room 106 and continues all day Saturday, February 27. The exhibit will be in the main library, Mudd Center. Complicated Relationships is the part of the Think/Create/Engage series on The Framing of Race.